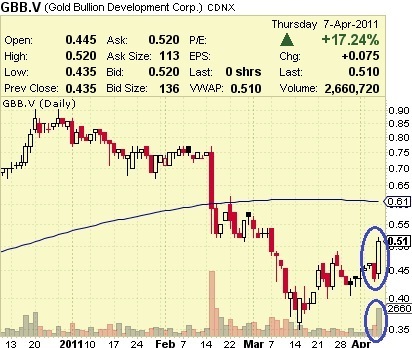 After slipping throughout most of the current year, the shares of Gold Bullion Development Corp. (CVE:GBB), (PINK:GBBFF) have started to gain ground on the TSX Venture Exchange over the last week. Yesterday, the advance of the stock was even more noticeable, confirmed by the large turnover. Are the bad days over for the shares? Still too early to say. During the last session, GBB made one of its largest jumps on the Canadian market (CVE) this year. The stock added 17.2% to its value, closing at $0.51, and the rise was additionally reinforced by the huge trading volume. More than 2.66M shares changed their owner yesterday on the CVE - it surpasses three times the company's average turnover. A possible reason for the upsurge of the stock was a Tuesday release regarding the company's Granada property in Quebec. Bullion completed 40% of its Phase 3 drill campaign on the project and disclosed encouraging assay results from the deposit. These include 1.51 g/t gold over 46.7 meters and 1.25 g/t gold over 72.25 meters. Yesterday, a progress report by Bullion's President Mr. Frank Basa, presenting the development of the Granada property, was announced on the company's website. This could have attracted investors' interest and may have been yet another reason for the run-up. As for the future shares' behavior - this is difficult to be foreseen. The historical performance of the stock suggests that GBB might probably meet resistance at $0.54 and find a possible support at $0.415. Bullion is at present overestimated by traders - the market cap is around $80M, while the net tangible worth of the company is about $19M. It implies there is probably not much room for a significant appreciation of the stock. The huge rise in stock dilution deserves attention too - the average number of outstanding shares has almost doubled over a one-year period, jumping from 73M to 145M. On the other hand, Bullion is financially stable - with $7M in cash in the end of 2010. The company has also 850 000 stock options, granted to its representatives in late March.